The main station building survives as a private residence with only minor alterations. The toilet block and goods lock-up at the west end of the main building have been demolished. The large goods shed to the west of the station is extant. Apart from blocking the rail openings the building is externally largely unaltered. Two pairs of railway cottages are in private occupation, one pair alongside Station Yard, the other pair in Station Road. Notes: Cambridge was granted city status by HM King George VI in 1951, by which time the Mildenhall branch served three locations within its boundary; Cambridge station itself; Barnwell Junction station and Fen Ditton Halt - the latter just falling within the city boundary. Ignoring these and thus Cambridge, the only other town, as Cambridge had previously been, to be served by the Mildenhall branch-proper was Mildenhall itself. In later years, however, Mildenhall also had train services to and from Ely and Newmarket; the former a city and the latter a town. The Ely service - if you could call it a 'service' with just one train per day each way - also served the town of Soham. Mildenhall lies in the north-west corner of Suffolk in what is currently the Forest Heath district of the county; a clue to the fact the town does not lie in the Fens, as commonly misconceived. The name Mildenhall is said to mean 'Middle Stone House'. There is another Mildenhall, in Wiltshire, but the name in that instance has a totally different meaning. Mildenhall, Suffolk, dates back to Anglo-Saxon times and its market dates back to the Royal Charter bestowed upon it in 1412. What was known as the Manor of Mildenhall was owned in the Middle Ages by the abbey at Bury St Edmunds and it is said the abbot had the right to execute criminals by hanging in Mildenhall market place. Both of these situations, towns and villages owned and controlled by religious orders and public executions, were commonplace centuries ago. Public executions in England were not abolished until May 1868 and the final public execution in Britain took place in August 1875 on the island of Jersey. Mildenhall was to remain under the abbot's rule until the Dissolution of the Monasteries by Henry VIII in 1536 when it was seized by the Crown and later sold to Sir Roger North. The Parish of Mildenhall was ultimately to become the largest in Suffolk. Its economy was largely agricultural but the sandy heathland was of little use for anything other than rabbits and sheep. The area thus struggled on as best it could until there was a glimmer of hope in the mid nineteenth century when there were mutterings of the London - Cambridge - Norwich railway, then under construction, serving the town. This plan was opposed by the local gentry, however, and other schemes such as the proposed Newmarket - Thetford line also came to nothing. Thus it was that Mildenhall had to make do with its nearest stations, Kennett and Mildenhall Road, until Fordham opened in 1879. None of these stations were convenient and Mildenhall Road was some 7½ miles away. It remains open today, long since renamed Shippea Hill. Similarly, Lakenheath village is about four miles from Mildenhall but its station is equally remote from Mildenhall, as is what is now Shippea Hill. 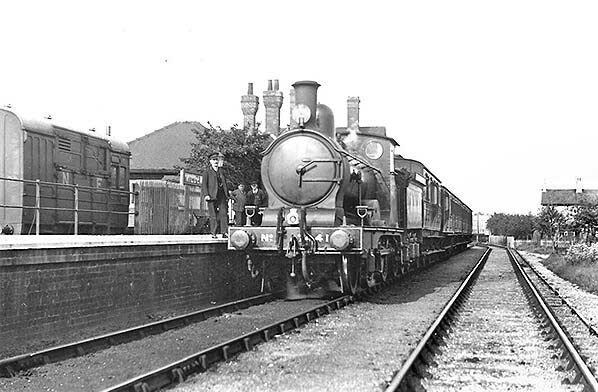 It has been said that the railway arrived at Mildenhall too late to revive the area's fortunes but the reasoning behind this is difficult to understand. Possibly it was a retrospective observation made during the depression years of the 1920s and 1930s which, as things turned out, was when the future for Mildenhall and the surrounding area began to look brighter. In 1931 construction of RAF Mildenhall was started and completed in 1934, the year of The Great Air Race which started at Mildenhall. It ultimately became a USAF base in 1951. Just four miles away was - and still is - RAF Lakenheath. This had been built during WWII as a decoy for RAF Mildenhall but was soon converted into an operational base, again ultimately manned by the USAF. RAF Mildenhall in particular was to boost the fortunes of the town and at the time of writing 18% of the town's population is American. The air base brought additional revenue to the Mildenhall branch, especially during wartime insofar as military freight was concerned, but the dire levels of passenger services stifled any 'shot in the arm' that the base could have provided to the branch in respect of passenger traffic. In the Second World War military freight was taken by rail to Mildenhall, much of it munitions. This traffic was routed via Newmarket and usually ran during the night. On at least one occasion a munitions train bound for Mildenhall escaped enemy aircraft attack by hiding in Newmarket Tunnel. There were also attacks on branch passenger trains during the war; one near Exning Road Halt and another near Worlington. As was the practice during the war, station and signal box nameboards were removed and stored away under lock and key. Sadly, it was announced in early 2015 that US Forces are to pull out of Mildenhall and this will no doubt be a blow to the town's economy. Loss of the railway was no such blow; its presence had become more incidental than a vital asset to the local economy. The population of Mildenhall was given in the Domesday survey as being ‘64 families’. In the 2011 census it was given as 13,388 persons. Over the life of the railway the population remained in the three-thousands until 1951 when it had doubled to 6,742 and this had increased to 7,132 by 1961. The significant increase from 1951 is explained by the presence of the USAF and also by Mildenhall later becoming a London overspill town. For the latter, new housing was provided as well as jobs in, mainly, the form of light industries. As history tells us, none of this was to save the Mildenhall branch as by this time road transport was very well established. A better passenger service might have helped but neither BR nor governments of the time, who were interested only in road transport, saw it that way. BR did, however, make a token effort by running some trains to and from Newmarket but, again, the service level was too dire to be attractive. Events which resulted in the construction of the Mildenhall branch have been described in the Mildenhall branch history, but long before the railway reached Mildenhall in 1885 the Norwich line had received improvements in the Lakenheath area to prevent flooding, and this work proved to be largely successful. For that reason the branch was never to progress beyond Mildenhall nor, it appears, was it intended to by the time construction commenced. Of course, the Barnwell Junction - Fordham section could also serve as a diversionary route for the Cambridge - Ely line and did so on numerous occasions, the final occasion being not long before closure following a freight train derailment near Waterbeach. Nevertheless, waters are muddied somewhat by some last minute dithering over whether to provide a locomotive turntable at Fordham or Mildenhall. Reasons for the dithering were not stated, and we can speculate for ever and a day, but we do know that the decision that Mildenhall was to be a terminus was made well before the line came into being. The last specific mention in company records of a route to Thetford from Cambridge for flood avoidance purposes was in September 1880. Records are then silent until 1882 and thereafter when specific mentions of a Cambridge to Mildenhall railway were made. Plans for the Mildenhall - Thetford section were thus abandoned sometime between 1880 and 1882, at least three years before Mildenhall station opened. Mildenhall terminus was built in the style of a through-station and this had led many to assume an extension to Thetford was always intended. However, there is no evidence whatsoever that this was the case and Mildenhall terminus would have been built in through-station style simply because this was the contractor's standard design for the branch. Actually situated in the parish of Barton Mills, the station is just beyond the southern edge of Mildenhall and was reasonably convenient for both Mildenhall and Barton Mills. In view of its considerable catchment area, one may wonder why Mildenhall station did not generate more traffic. Part of the answer is the often-mentioned level of service which was dire for the entire life of the branch although, in fairness, it was no worse than on many other branch lines during the early years. Another part of the answer may lie in social attitudes. Decades ago rural people did not travel widely and tended to be locally focussed, travelling only to their nearest market town; Mildenhall is a market town so its people had little need to travel for their provisions. People from Fordham would go to either Ely or Newmarket on market days, while Burwell people would travel to Cambridge or Newmarket. This only left Isleham, with its station inconveniently sited. Thus with all of these factors thrown into the pot, it is not difficult to see why Mildenhall station generated little traffic and the situation for the railway worsened with the coming of road motor transport. Quy excepted, station buildings on the Mildenhall branch all bore a family resemblance but varied in the finer details and orientation depending upon whether located on the up or down side. Mildenhall was no exception and virtually identical to Burwell and Isleham with the exception of its single platform. The single-storey range contained a booking hall, stationmaster's office, waiting room, toilets and staff room. The L-plan brick building included a two-storey stationmaster’s house with the single-storey range attached. On the two-storey section, facing the forecourt, the principal gable was under a half-hipped roof, and a slightly recessed section adjoining the office range was treated to its own pitched gable with timber braces. The door of the office range which gave access to the booking hall was sheltered by a gabled porch supported on brackets, and beyond it was a large unadorned gable. There was one doorway to the platform from the booking hall and waiting room with a second doorway serving as the Way Out from the platform. Gents' toilets were reached from the platform while access to the ladies’ toilets would have been from the waiting room. Fireplaces were provided in each room with semi-ornate stepped chimneystacks on the roof. A brick lock-up was provided at the opposite end of the station building to the house; this comprised a single-storey square brick building with a hipped roof. Over and above this general description, Mildenhall station had a single 365ft platform, ramped at both ends, and a 650ft run-round loop. The turntable road was 290ft. 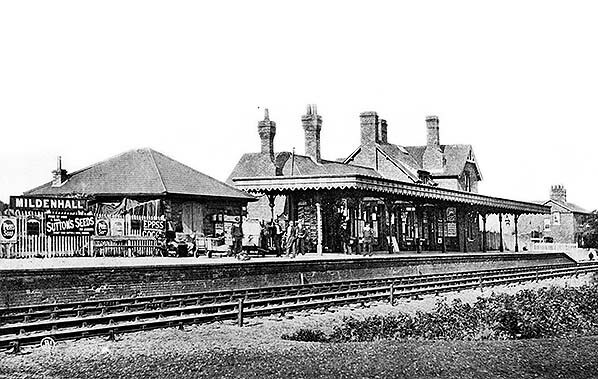 Mildenhall station, 20m 59ch from Cambridge, was gas lit from at least early 1903 and possibly from the outset. The town had its own gasworks, located on the south side of the town and close to the station. The gasworks is known to have been supplied with coal via the River Lark but it is not known if coal was also, or entirely, supplied by rail once the railway arrived (the gasworks predated the railway). It would be surprising if it was not but in the absence of written and/or photographic evidence we do not know for certain. A few yards beyond the end of Mildenhall's platform, the branch ended abruptly at a buffer-stop. There was a run-round loop which would have been the up platform road - had the line continued beyond Mildenhall and a second platform been provided. 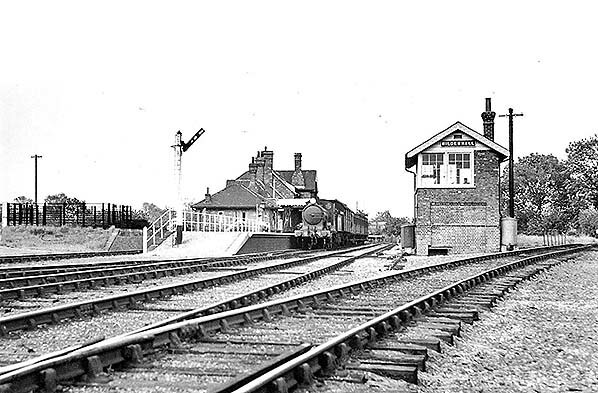 At the Isleham end of the station and on the up side stood the signal box, a 25-lever McKenzie & Holland box. Beyond the signal box was a trailing connection to the turntable road which ran behind the signal box. The turntable was hand-operated and originally of 50ft diameter but for reasons unknown it was later reduced to 49ft 6in diameter. Beyond the turntable was a pit, immediately beyond which the turntable road terminated at a buffer-stop. These were the only locomotive facilities provided at Mildenhall despite locomotives being outstationed, and crews based, at Mildenhall between 1885 and 1915. Outstationed locomotives, usually Adams K9 Class 0-4-2Ts, had to be coaled and watered at Cambridge with water supplies also being available at Fordham. Layout of the goods yard vaguely resembled that at Burwell owing to the presence of a scissors crossing, but there were a number of detail differences. The major difference was the provision at Mildenhall of a 150ft x 40ft goods shed which included a granary and a 1½-ton fixed crane. Track layout comprised a 620ft goods shed road, 610ft goods loop passing along the south side of the shed, 210ft dock road and a 220ft headshunt. The scissors crossing was between the goods shed and station. The dock road was at the usual location behind the passenger platform and also served the three cattle pens which, as at all stations where pens were provided, had a water supply. Other provision included the usual loading gauge, a 5-ton weighbridge and a 22-cwt weighing machine. Where the weighing machine was located at Mildenhall is not clear and its capacity seems rather excessive. However, Fordham is also said to have had a weighing machine of similar capacity and as Fordham also had a goods shed incorporating a granary it is possible that the machines were located therein. Mildenhall would also have had scales for weighing parcels, usually located in station buildings, but no details appear to be available. One source adds that Mildenhall also possessed a wagon turntable but absolutely no evidence of this has come to light, nor, for that matter, has any need for one. The statement is suspected of being an error actually referring to the locomotive turntable. Two staff cottages were provided and were known as numbers 1 and 2 Station Yard. They were reached from, and faced onto, the station approach road. Two further cottages were provided in 1905 at the behest of James Holden, these being located on Station Road and on the south side of the railway, for the benefit of crews working the outstationed locomotives. However, the precise arrangements regarding who occupied which of the eventual total of four cottages are unclear as there were two locomotive crews at Mildenhall, four men in total, plus other staff who required accommodation. Originally the crews lodged in the area but problems with finding suitable lodgings resulted in the provision of the two additional cottages. Historical reports on the cottages are rather conflicting as to which were built first and for whom, so the preceding details are based on contemporary maps, plans and surviving company records; these records indicate that the second pair of cottages was a long-drawn-out affair. The matter was first raised in 1888 but the work was not sanctioned until as late as November 1903 and the cottages were not ready until November 1905. The final cost was £508 and occupants were to pay a rent of four shillings per week. When the use of outstationed locomotives ceased, all four cottages were then occupied by other staff and the crews were transferred to Cambridge. Staying with outstationed locomotives for a moment, no details have been found concerning overnight arrangements. As we have seen, Mildenhall had a pit on the turntable road but no other locomotive facilities whatsoever so the most likely scenario is locomotives were kept in light steam overnight and probably stabled over the pit. Worth a specific mention because it started from Mildenhall is the through service to Chappel & Wakes Colne. This was the first up train of the day from Mildenhall and the time varied: in 1958 it departed at 7.38am but by 1962 it departed at 7.34am. It called at all stations and halts to Cambridge, then all stations to Chappel via Halstead and was a working introduced with the diesel railbuses in July 1958 as part of the cyclic diagramming needed for railbuses on the Witham - Braintree/Maldon branches. It reached Chappel at 9.35am (summer 1959 timetable). On Saturdays it ran in service to Marks Tey (arr. 9.41am) before running light to Witham but on Monday-to-Friday it ran light from Chappel, passengers needing to change there onto a following service from Sudbury. The railbus, being relieved at Witham, returned to Cambridge in service from Marks Tey, departing at 1.22pm, but the journey was a long-drawn-out affair. It ran as far as Halstead where it laid over, then to Haverhill where there was a further layover before finally reaching Cambridge at 4.02pm. The service from Mildenhall to Chappel was not shown in the Mildenhall branch timetable as a through service but was shown as such in the Cambridge - Haverhill - Marks Tey timetable. It was, of course, diagrammed for a railbus but sometimes a DMU was substituted when a railbus was not available and it was usually for this reason that a DMU could be seen on the Maldon branch from time to time; but sometimes the substitution was planned, such as when an event at Maldon, a fair for example, demanded extra capacity. Things changed when the Colne Valley Line (via Halstead) closed and the Braintree branch abandoned railbuses in favour of DMUs. From then on the changeover at Witham, which continued for the Maldon branch, ran via Sudbury but commenced from Cambridge at a different time to previously, while the 7.34am from Mildenhall terminated at Cambridge. With these changes, the 6.37am Cambridge - Mildenhall and 7.34am return was given over to DMUs and this remained the case until closure of the Mildenhall branch to passengers. The Mildenhall - Chappel/Marks Tey through service was, incidentally, the longest service ever operated by a BR diesel railbus. It ran, as explained, for operational reasons and it is doubtful whether many, if any, passengers undertook the entire journey or even a large part of it. Things plodded along as always at Mildenhall until the famous Wickham DMU E50416/E56171 rasped out of the station on Saturday 16 June 1962 with the final passenger train, the 7.31pm to Newmarket. Mildenhall station finally fell silent on Friday 10 July 1964 as Brush diesel D5662 chortled away with the final goods train, clearing wagons from the Mildenhall - Fordham (exclusive) and Burwell - Barnwell Junction sections. Mildenhall retained a stationmaster to the end, the final incumbent being Nathan Sykes, but economy measures over the years meant that from 1933 the position also embraced Isleham. In 1940 Les Turner held the position. Hitler's bombs failed to get Mr Turner but on 5 November 1942 a shunting goods train did. An open wagon door became wedged against a wall and Mr Turner attempted to free it while the train was moving. He became trapped between the door and the wall. He died instantly, before the driver was able to bring the train to a halt. Mr Turner was replaced by Len Eady who remained in the position until 1959 when Michael Goddard took over. Mr Goddard remained until 1962 when Mr Sykes began his brief tenure. BR began removing fixtures and fittings immediately after the passenger service on the branch ceased - the very next day in fact. 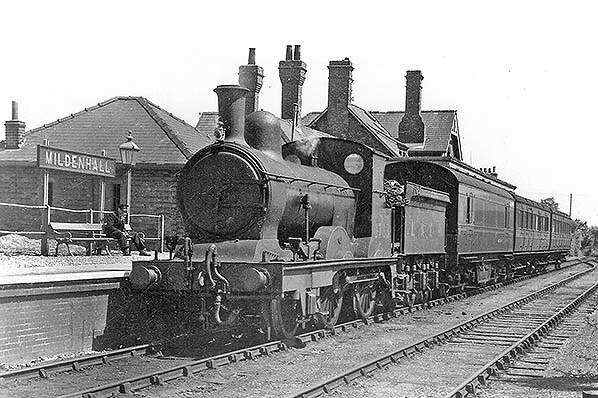 Mildenhall's turntable was removed sometime during goods-only days, its last known use being on 13 June 1962 when J15 65460 visited Mildenhall with a Cambridge University Railway Club special. The turntable and locomotive pits were subsequently infilled. 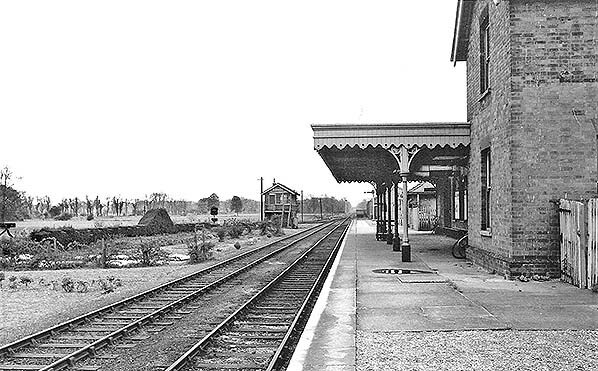 Mildenhall station then stood abandoned until it was sold by auction in 1971. Today the station remains largely intact; a conservatory now occupies the platform area (the canopy was removed immediately after the end of passenger services) and the gents' toilets and the lock-up have been demolished. The dock also remains as does the goods shed, the latter now in commercial use and with its rail entrances bricked up. Much of the area is now grassed and, at the time of writing, the outlines of the infilled turntable and locomotive pits are visible from the air. Everything is neatly maintained and, it has to be said, quite delightfully so. Tickets from Michael Stewart and Graham Larkbey . Route map drawn by Alan Young. Bradshaw from Nick Catford. & timetable from Alan Young. Click here to see a 17 minute colour film of a steam locomotive travelling from Cambridge to Mildenhall. Includes all the stations on the line, From Cambridge Community Archive Network. Mildenhall on a postcard view. As we have seen from period views of other stations, advertisements abound. Pears Soap, Sutton's Seeds and Epps's Cocoa are all present. Beneath the 'ILD' of Mildenhall is an advertisement for Blue Cross, the well known animal charity still with us today. Blue Cross was founded as Our Dumb Friends League in 1897. In 1912 the charity launched The Blue Cross Fund for the care of horses injured in The Balkans War and did the same on the outbreak of WW1 in 1914. Appeals for help were made under the 'Blue + Cross' name, hence the advertisement seen above at Mildenhall. The postcard therefore dates from no earlier than 1912. The charity officially changed its name to The Blue Cross in 1950 and to Blue Cross as recently as 2011. On the right the two original staff cottages can be seen while on the left is the parcels lock-up. Note the chimney towards the rear of the lock-up; this detail varied from station to station and the lock-ups at Bottisham and Burwell appear to have had no stove or fireplace at all. The men on the platform appear to be staff bar one who is wearing a straw hat. There is reasonably brisk business in parcels and trunks. Mildenhall station on a 1904 OS 1:2500 map. Station Road is on the right and leads south-east to Barton Mills. The signal (S.P) is shown in its original position adjacent to the signal box. It was later moved to the end of the station platform. On the south side of the approach road the original pair of staff cottages can be seen; the other pair was yet to appear and would be where the number 24 is marked adjacent to Station Road. The two small buildings either side of the existing cottages were probably sheds or outhouses associated with the cottages. The plan suggests that they had chimneys. Apart from the later shortening of the platform canopy, and a possible alteration to the cattle pens, everything else within the railway boundary is as it would remain until the line closed. 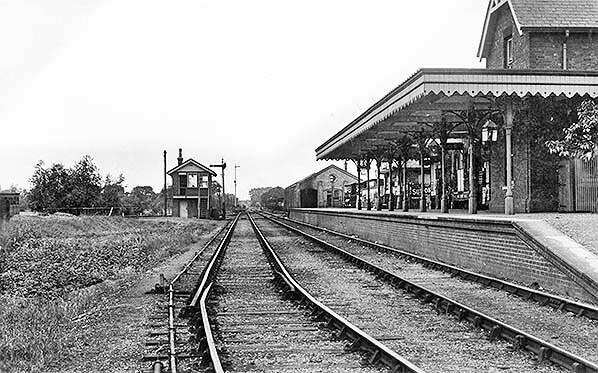 Mildenhall station sometime in the early twentieth century. The end of the line is thirty-or-so yards behind the camera. The trap points in the foreground are interlocked with the points at the end of the run-round loop immediately behind the camera. When the Fordham - Mildenhall section was under construction the GER made much of interlocking, apparently to satisfy the Board of Trade. Beyond the station building the lock-up can just be seen, beyond which are two cattle wagons in the dock. Beyond the goods shed a mix of other wagons can be seen. 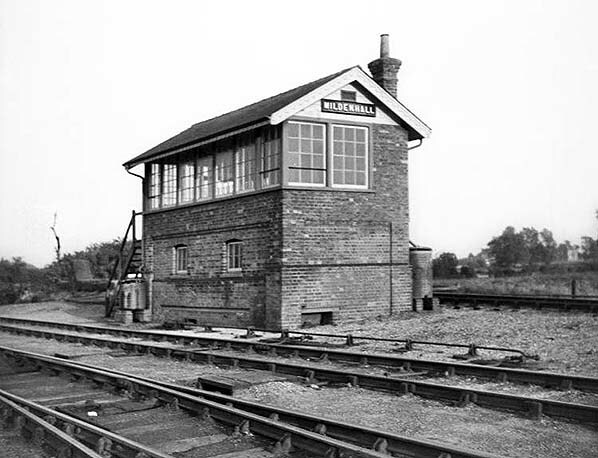 The signal box has no nameboard on the near end, quite logically as Mildenhall was a terminus, but one was later added. The signal is in its original position while that in the distance has its lamp midway down the post in the same manner as Fordham down distant. The turntable is just visible in front of the trees to the left of the signal box. The station roof was specified for tiling but was changed to slate during the construction period and for which the contractor billed the GER an extra £3 per station. 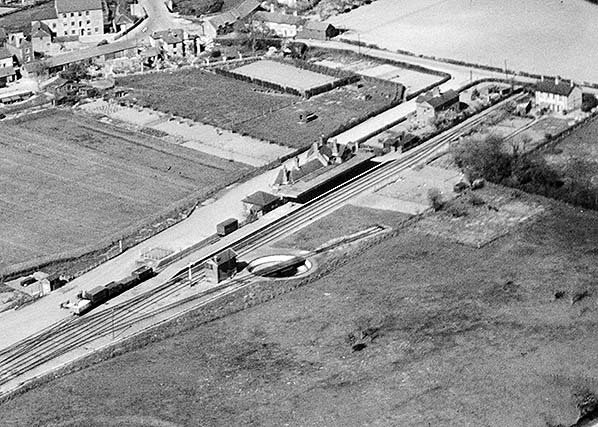 This aerial view of Mildenhall station dates from April 1930. All the station's features can be seen including both pairs of cottages, turntable, signal box, lock-up and, left, the weighbridge. Also visible are the cattle pens, opposite the signal box. These are something of a mystery as Mildenhall is recorded as having three pens yet only one is visible. On the ground is what appears to be the outline of the other two, so perhaps two were removed to provide better access to the dock. The land between the turntable and the second pair of cottages is gardens. Plots were rented to railway staff and it was a sensible way of utilising otherwise spare land to the benefit of both parties. A similar arrangement was in place at Burwell. The platform canopy is still at its original length and a rare glimpse is afforded of how it continued around the corner of the station house. The canopy would soon follow in the steps of Burwell and Isleham by being shortened, part of economy measures and alterations which had begun in 1921. The building at the top left of the image was a flour mill and it still stands today, now converted into flats. The gas works is just out of view at the top of the image. A nice crisp view of Mildenhall in June 1938. To the left of the locomotive the lock-up, dock and the cattle pen can be seen. The signal is now in a more conventional position at the end of the platform and sports an upper quadrant arm. This was done as part of the signalling rationalisation on the branch in 1935. To the right of the signal box, the turntable can just be seen. The tanks either side of the signal box are butts for collecting rainwater. Good use was made of this natural product at one time, in both rural and urban areas, for watering gardens, washing down paving etc. The train is a strengthened set of conductor-guard stock and includes a milk van. It must be market day. Class E4 2-4-0 No.62781 awaits departure from Mildenhall amongst, it would appear, a flurry of human activity. The locomotive is one of those which had been sent to the north-east in the 1930s and received a side-window cab to protect the crew when working over the Stainmore line. The bottom of the smokebox door has received a lick of paint, probably to cover up the greyish-white area caused by overheating. This damage was a not uncommon sight and was usually caused by a build-up of hot ashes in the bottom of the smokebox. This photograph came undated but a little MI5 style snooping reveals the date as 18 April 1949, and the train is the 5.48pm to Cambridge via Burwell. At this time, this was not the final train of the day; there was a 7.45pm ex Cambridge via Burwell which returned from Mildenhall at 9.00pm but to Newmarket omitting Worlington. The train seen above had been strengthened; behind the locomotive was a 6-wheel passenger brake, behind that the usual 2-car branch set with funny steps for the halts and at the far end of the train was an all-third carriage. Some tank wagons can be seen in the dock, left. The locomotive survived until January 1956. Mildenhall signal box looking south-east with the end of the station platform just off the image to the left. The date is unknown but from certain features, including point and signal rodding and cable routing, we know it is from the 1938 - 1950 period. The box followed, as might be expected, the general pattern of others on the branch but was somewhat larger and differed in the finer details such as window size. They were solid structures and used a minimal amount of wood. The rear wall was entirely of brick. Mildenhall box was fitted with a 25-lever McKenzie & Holland frame and it remained in use until the end. Various economies and alterations over the years meant, however, that many of the levers became redundant and by 1962 the box contained at least nine redundant levers. Unlike Mildenhall station which was gas lit, the signal box appears to have remained oil lit to the end. Behind the box the turntable road can be seen, while the track passing the front of the box is the run-round loop. The track in the foreground is the running line and the points are part of the scissors crossing which allowed access to / from the east end of the goods yard. Records of signalmen employed at Mildenhall are patchy but two known were George Nicholas and George Leverington. Mildenhall in June 1951. The locomotive, E4 No.2783, is still in LNER livery and was not to receive BR livery and numbers until January 1952. She did not last much longer, being withdrawn in December 1954. Behind the locomotive is an ex-LMS CCT van with lining, which tells us the van is still in either LMS Crimson Lake or maroon. The LMS made the transition from the former to the latter in 1946. Crimson Lake is technically not a paint colour as a Lake is a varnishing process incorporating coloured pigment. The finer details of this and variations in livery shades would fill volumes so we will leave it at that in this image caption. The remainder of the train, above, is the usual ex GER set for the period and converted for conductor-guard working. The stock is a Diagram 527E brake third, one of six built in 1907, and a Diagram 227E composite, one of 75 built between 1907 and 1915. On the platform seat what appears to be the guard is filling in his log. On the left is the lock-up, intended for parcels and other items needing secure storage but latterly often used for storage of coal, oil and other station necessities. Note the narrow windows, no doubt useful for firing arrows at marauding bandits! The narrowness was, of course, a security feature but from photographs of these buildings, with their wooden doors, security could be said to be only average at best. 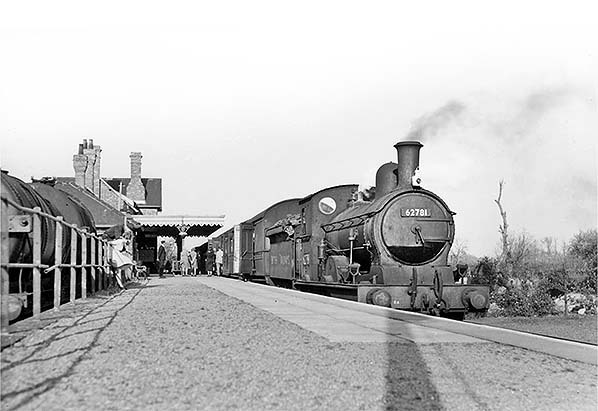 A May 1952 view along Mildenhall's platform. The track on the left is the run-round loop and would have been the up platform road had the line been extended beyond Mildenhall. In the far distance, in the gap between the trees, the bridge at Worlington Golf Links Halt can just be made out. The signal box by now has a nameboard on its east end. Somebody enjoys topiary, if the hedge on the left is anything to go by. The buffer-stop on the extreme left is at the end of the turntable road. With staff cottages, stationmaster's house and spare land let to staff to use as gardens and vegetable plots it is easy to realise just how much of a community rural railway stations once were for their staff, their families and, indeed, their regular passengers: not that Mildenhall saw large numbers of the latter. On the platform, the shortened canopy is clear to see. Why canopies along the branch were shortened is not recorded; it would not have made any significant reduction to maintenance costs but would have saved the expense of an oil or gas lamp. The most plausible reason, and perhaps obvious when looking at the above image, is that the original canopy blotted out too much light from the stationmaster's house. After all, occupants had to pay rent so could rightly complain if they so wished. The exception, on the Mildenhall branch, was Quy where the porter-in-charge, following the early abolition of Quy stationmaster, lived rent-free in return for operating the level crossing gates in addition to his normal duties.